Friday Sept 21st was our last day at Windy Valley Llama Farm, Pam and Jerry hosted a dinner on their deck for us as we depart and for Tom and Vicky as they start their workamp gig. 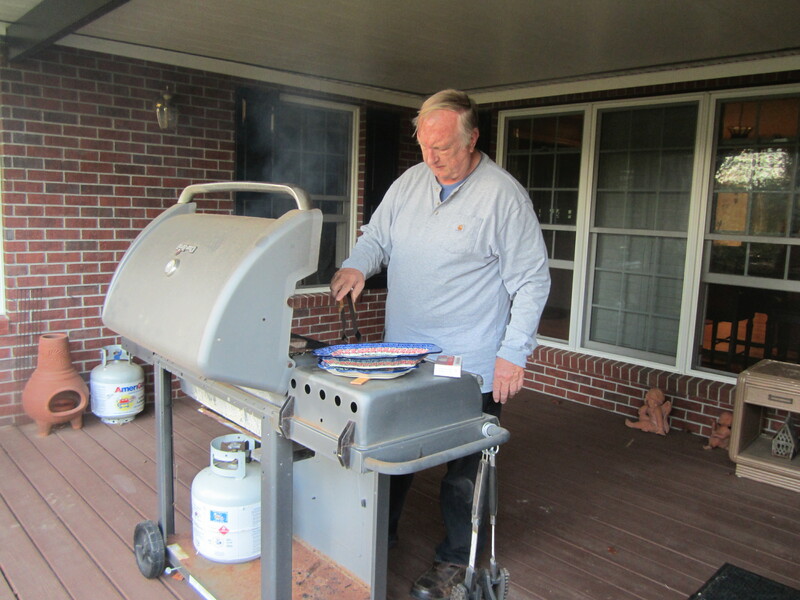 Grilled Rib-eyes, Potato Casserole, and Steamed Broccoli where on the menu – YUM. Jerry did a great job on those rib-eyes. And no dinner can be complete with out an exquisite dessert provided by Tim and Karen. We broke up early since we were all tired from the hay delivery a few days earlier. Tim and Karen said they would come by in the morning for farewell hugs. 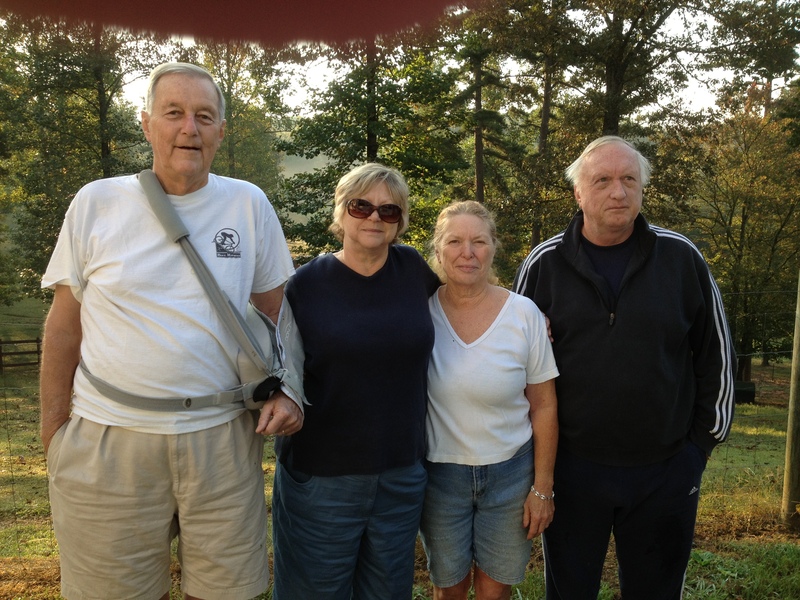 Tim and Karen are on the left – Pam and Jerry on the right. We will miss these fine folks. Both have told us we have a place to park or stay when we come back to Blue Ridge. Pam and Jerry have also invited us to come back for another workamp session whenever we are ready. 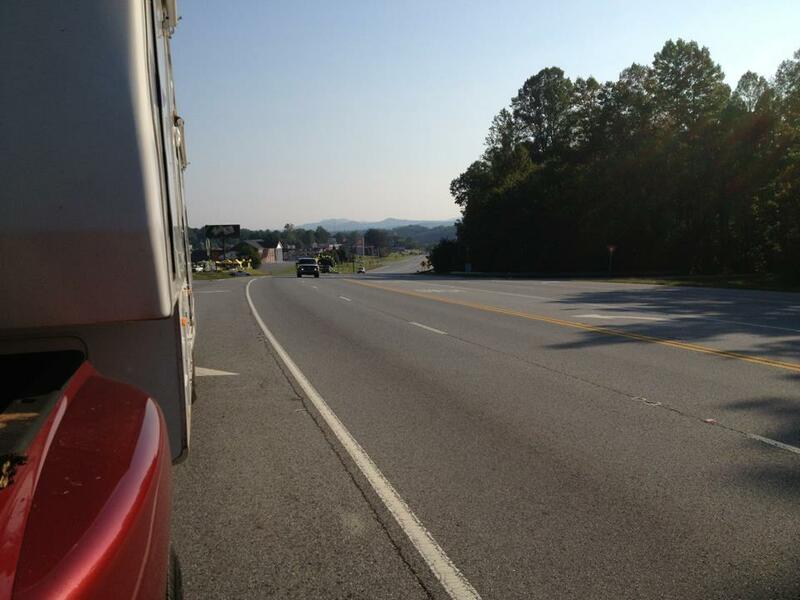 We pulled out just before 9:00AM and took a parting photo of Blue Ridge, GA looking to the east. We will miss the mountains and cool temperatures as well as the new friends we are leaving behind. Our target for Saturday was Tuscaloosa, AL. We knew we were traveling with one weak battery. The other battery was a used battery I bought in December last year. Jerry told us about a large RV dealer in Alabama on I-20 so we decided to stop and replace both batteries. That would give us comfort in knowing we could get slides out and back in should we decide to stop at Camp Walmart. Dandy RV in Anniston, AL is indeed a large RV spot – kinda like Camping World. Finding 2 batteries was not a problem. The sales person installed the two batteries and took the bad ones away. Pockets are now $200 lighter but we will rest easy tonight. We pressed on to the West keeping our sights on Tuscaloosa. We found the Walmart conveniently located to I-20 and across the street from easy to get to restaurants. We actually parked in the Sam’s parking lot, next door to Walmart. First time I’ve seen a Sam’s and Walmart share a parking lot. We wanted to try a local place for diner but Chili’s was across the street from Walmart. That was the closest option since we were on foot. We kept the truck and RV hitched. We got what we expected at Chili’s, then walked across the parking lot to Books-A-Million thinking we could connect to free WiFi. My MacBook Pro connected just fine while Carol’s PC had issues. I spoke to a sales person who told me the WiFi was free only to Books-A-Million club members. OK, what does that take. $7.95 for 24 hours or $24.95 for 12 months. I said no thanks. It was getting late so we closed up shop and walked back to the RV. At least we got phones and computers charged for free. Sunday AM, we opted for breakfast at Cracker Barrel. No reason to break our Not Normal Eating Places pattern. Getting into the parking lot required a bit of maneuvering. I drove past the entrance because I was pointed the wrong direction. I got off the highway, onto a side street and halfway up the driveway to a gas station when I though, this driveway is pretty steep. No way to back out, bad approach to the drive way so I just let the truck pull the trailer up the incline. We did not hear any scraping but I sure felt it. When we got parked at Cracker Barrel, I took a look a saw a chuck of asphalt on the badly mangled right rear stabilizer. The stabilizer prevent me from ripping off the back cap of the RV. We can say that we will never stay at a Walmart or Sam’s or Flying J or any other public parking area again. With no electricity, we needed to keep the windows open. For me that was not a problem because I hear nothing when my hearing aids come out. For Carol that was a different story. Between the Parking Lot Zamboni, delivery trucks arriving before dawn and the drone of the generators from the other motor homes next to us, Carol did not get much sleep. Many of our RVing friends do it. I am happy for them. This type of overnight stop is just not for us. After breakfast and a fresh load from Starbucks, we hit the road again. 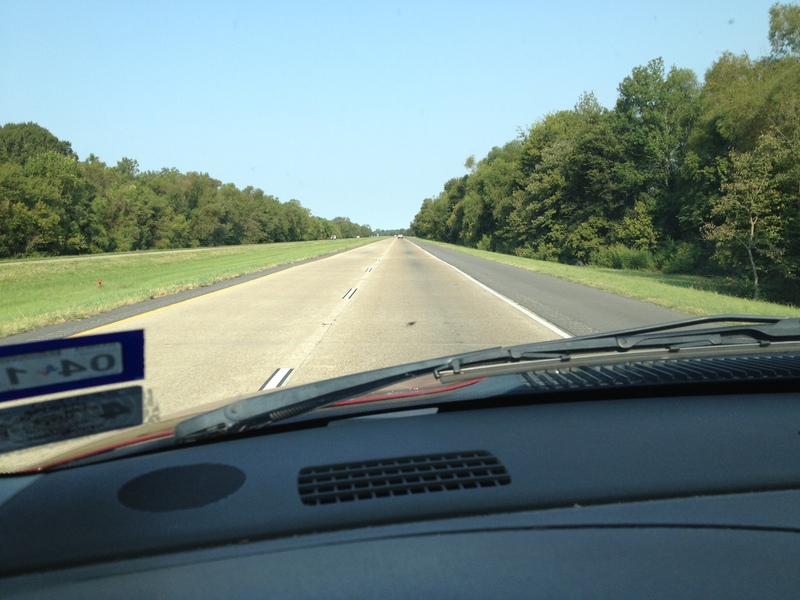 Next stop – Vicksburg, MS. As we made our approach to Vicksburg, Carol scouted for RV parks. 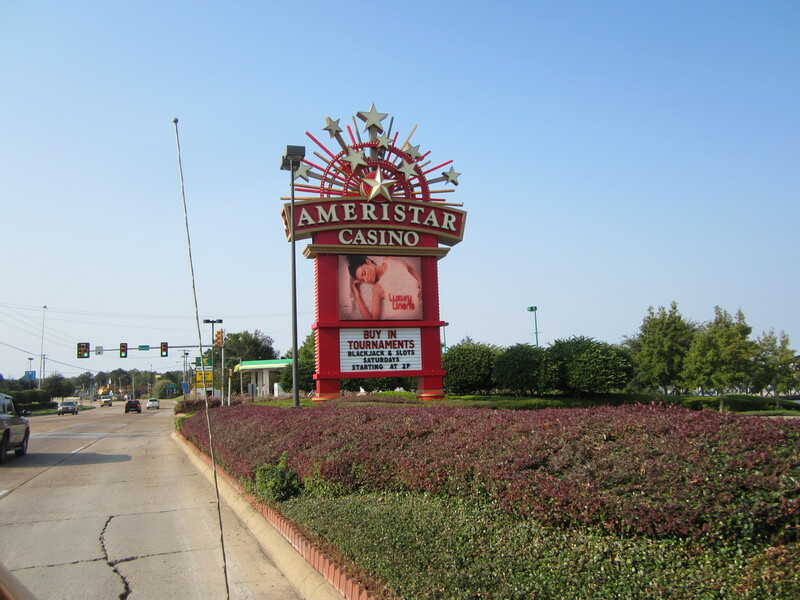 She picked the Ameristar RV park across the street from the Ameristar Casino. Good choice. We were fortunate to get a site that was pretty flat and level side to side and front to rear. There are some sites that are way out of level. We had free shuttle to the Ameristar Casino where we found Bourbon’s BBQ and Steak. Food was a bit pricey but it was absolutely some of the best eating we’ve done in a long time. After dinner, we decided to spend a little time playing penny slots. We agreed to play with $50 each and stop when we were out of play money or tired. At the end of the evening, we were both ahead. I hit a lucky slot that paid off $49 on a 20 cent bet. I cashed out of that machine and went to another. We shuttled back to the Casino Monday morning for breakfast. 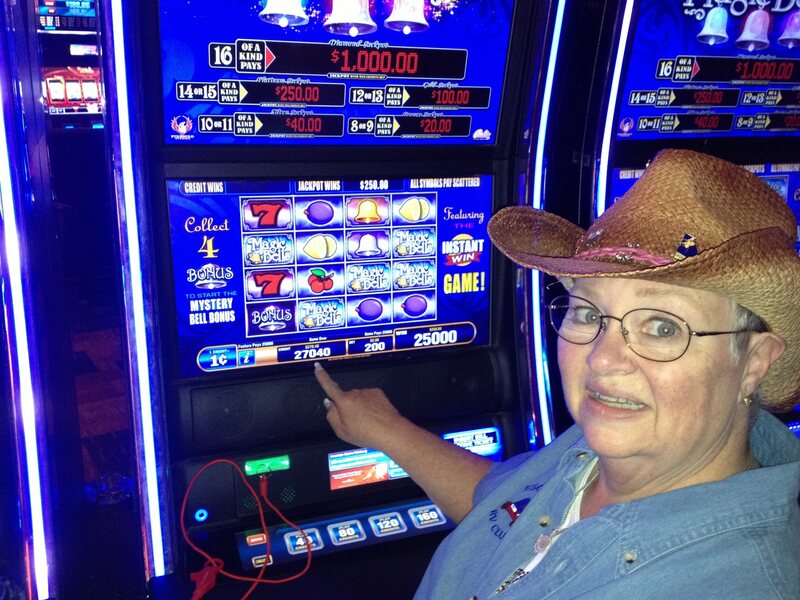 After breakfast, Carol said she wanted one more go at the slots. By the time I caught up with her she was just sitting at her slot. When I asked her what was up she just smiled said “I hit a jackpot.” The number she pointed at reads 27040. That translated into $270.40. Not a bad return for less than $20 bet. By the time we left Ameristar, we pretty much paid for over half our trip back to Texas. We will visit Ameristar again. We left Vicksburg, made the trip across the Mississippi River and headed for Tyler, TX. 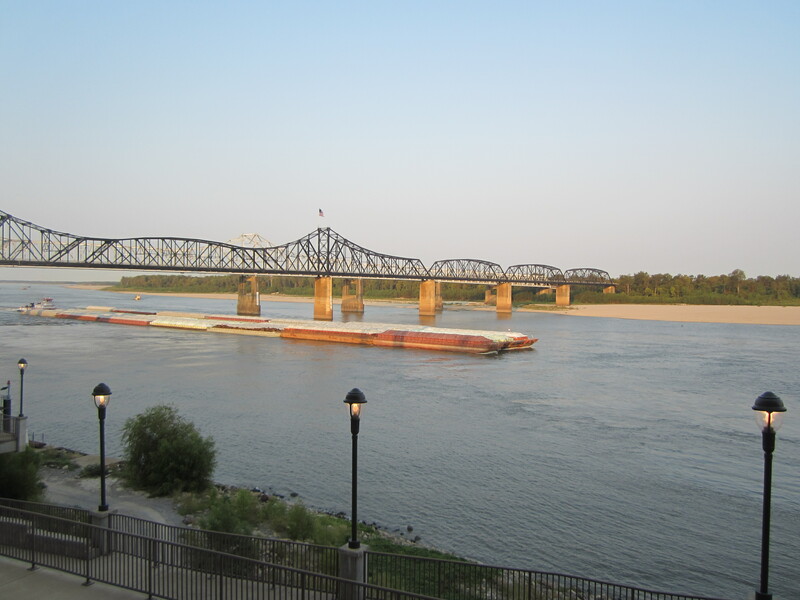 The river was low but that did not keep barge traffic off the river. I was mesmerized by the power in those small tugs pushing the loaded barges up river. It’s hard to see the individual barges here. There were 34 barges tied together being pushed by a single tug boat. Once across the Mississippi River, we were on what I call ‘the flat and straight highway’. I can certainly say the drive on I-20 is significantly better than the drive on I-10, especially in Louisiana. 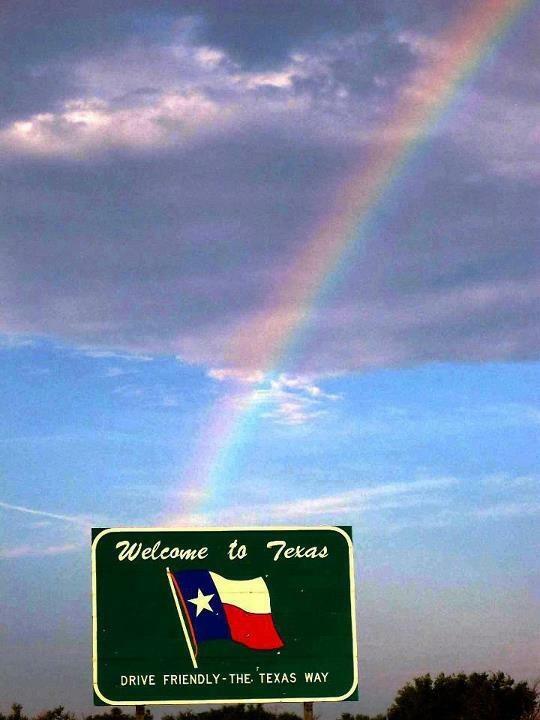 Then we finally hit the Texas state line about 1PM on Monday 9/24. We knew we were back home. First thing we noticed was the smoothness of the roadway. Texas knows how to take care of its highways. If you think that is stretching things a bit, I challenge you to make the comparison. I know there are some rough patches but mile for mile, Texas does a super job in taking care of its highways. We stayed in a small RV park in Tyler, TX just off I-20 5-Star RV Park. The park is country living at its best. Away from the hustle of busy streets and very quiet at night. The park is owned and managed by an Englishman and his two sons. We opted for TexMex for dinner Monday night and were disappointed. Apparently we were not far enough south for the real deal. 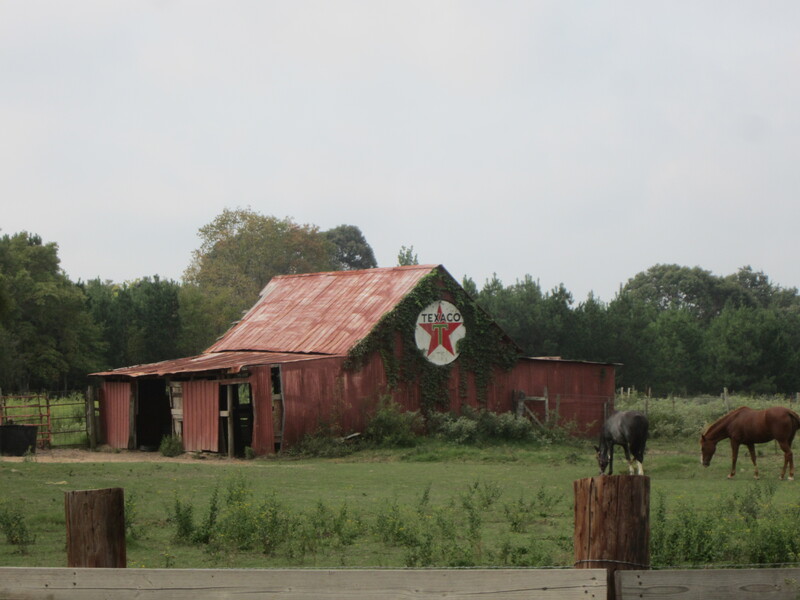 We drove to the south end of Tyler for breakfast Tuesday morning. The Diner made up for the marginal dinner. They certainly know how to do breakfast – Texas style. Our friends Stephanie and Greg from RV There Yet were in Lindale, TX just north of I-20. Sure wished we had extra time on our schedule to pay them a visit. Maybe we can connect when they come back to Texas later in the winter. Our next and final stopover would be in Killeen, TX. 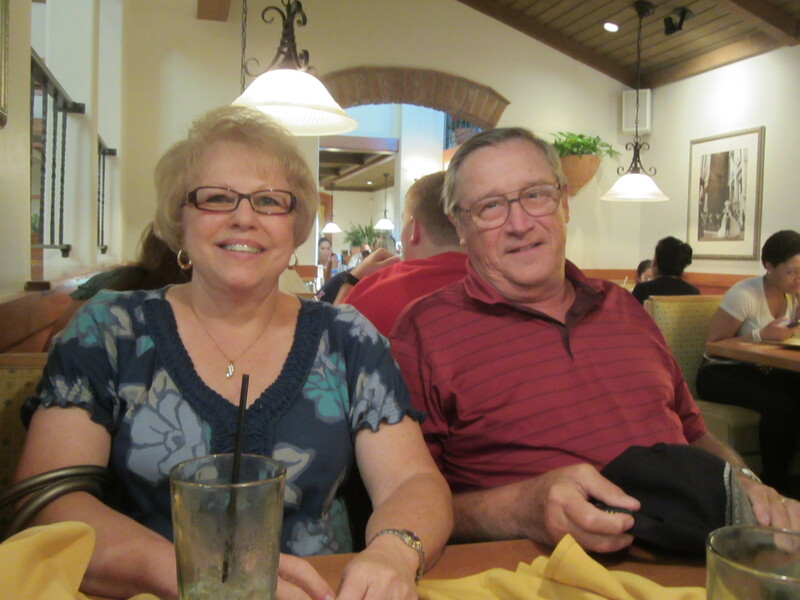 Carol’s Aunt and Uncle live in Copperas Cove near by. 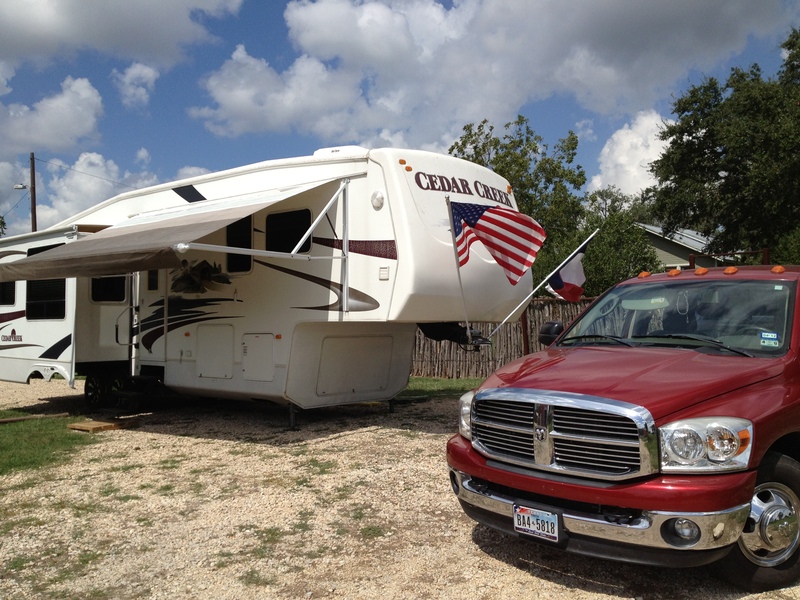 We stopped at Cicada Springs RV Park, This is an older mobile home park that is being converted to an RV park. We enjoyed dinner with Ron and Glenda at Olive Garden and had a chance to share with them our story of how we got to where we are. Thank you Ron and Glenda for driving over to Killeen to have dinner with us. Hope to see you guys in May next year at South Forty RV Park in Giddings, TX. After we got back to the park, we took the doggies for a walk. That is when Carol took a tumble onto the cement pad. She bruised her left wrist, right thumb and banged up her knee a bit. It did not take long for the park staff to hear about the tumble. They sent one of their residents who just happens to be an EMT to check up on Carol. He determined she did not break anything. We were fortunate. Dosed up on ibuprofen and wrist wrapped she appears to be on the mend. We opted for TexMex tacos for breakfast and were pleased. We finally made it far enough south. For readers who are contemplating driving down I-35 from Waco towards San Antonio. I would highly recommend heading a bit east to pick up US 281 which goes directly into San Antonio and connects with I-37 to Corpus Christi and the valley. It appears I-35 is undergoing a major expansion to widen it North and South of Waco. When we lived in Corpus Christi, it was always faster and less congested to take US 77 from Waco to Corpus Christi or US 281 from Waco to San Antonio. And always take the toll road around Austin. The cost is worth the drive. If you have to go to Austin, well, all I can say is, be prepare for stress and congestion. From Killeen, we headed West to Lampases then turned South on US 281 for a beautiful drive through Burnet, Marble Falls, and Blanco. Ended up in Boerne (pronounced burny) going west on TX 46 to TX 16, then north for a few short miles to Pipe Creek, TX. Our home for the next six months. If you travel near Bandera, or Boerne, TX, please plan to stop by. We are about 6 miles south of Bandera, and about 15 miles West of Boerne. That is it for this post. Thanks for stopping by. Y’all come back now. Next post, I’ll tell you a bit about the area and our work. This entry was posted in Alabama, Georgia, Mississippi, Texas and tagged Friends. Bookmark the permalink. When traveling we stay often in WalMart, etc. Kinna have gotten used to the noise. (Not all of them are noisy). We have a cheap generator (about $250.00) we bought at Cabelas years ago. Can not say enough good about it. Perfect for the times we need one. One of our granddaughters live in Burnet. We’ve been in the area many times. Not sure about this coming year. Might be as she is expecting to give us our 3rd great-grandchild any day now. If so, I need to keep it in mind that you are in that area.